Born 1833 in Cloonagh Beg, Queens County (Laois) Ireland. Died July 15, 1882 at age 49 in Macon County, IL. Arrived in U. S. June 1850. U. S. naturalization declaration originated in Warren County, Ohio on June 22, 1853. Date of Oath: Oct. 20, 1855 in DeWitt County, IL. Buried in Calvary Cemetery in Decatur, IL. Married Mary Helen Dempsey on October 4, 1858 in Macon County, Illinois by Rev. Father Thomas Cusack. Click for marriage license. Mary Dempsey is the sister of Anna who was married to William, the brother of Peter. Mary Dunn, the sister of Peter and William, married Michael Dempsey on Feb., 26, 1854 in Lowell, MA. Parents of Peter Dunn: Peter Dunn and Mary McCabe from Queens County, Ireland. Father of Mary Helen Dempsey is John Dempsey. Click Here for McCabe history. Peter, William & their sister Mary arrived in Boston aboard the Ship Buena Vista on June 1, 1850. Occupation : Laborer Port of Departure : Liverpool Ship : Ship Buena Vista Microfilm Source National Archives: Series M277, Roll 34 The ages of Peter and Mary are correct. William was actually 23 as birth date of Nov, 10, 1826. 3. Peter Dunn & Mary Dempsey. Married: October 04, 1858 in Macon County, Illinois. She was born 1840 in Rosenallis, Queens County, Ireland, and died December 1896 or 1916 in Decatur, IL. i. JOHN J.3 DUNN, b. July 14, 1864, Macon County, Illinois; d. March 01, 1928, Macon County, Illinois; m. (1) MAGGIE T. NOLAN, May 31, 1886, Sacred Heart Church, Dalton City, Illinois; b. 1862; d. Macon County, Illinois; m. (2) CATHERINE HUGHES, January 11, 1898, Sacred Heart Church, Dalton City, Illinois. ii. MARY HENRIETTA DUNN, b. January 07, 1862; d. July 28, 1952, Los Angeles, California; m. PATRICK F. NOLAN, February 22, 1887, Sacred Heart Church, Dalton City, Illinois. iii. WILLIAM P. DUNN, b. 1864, Milam Township, Macon County, Illinois; d. April 1915, Decatur, Illinois; m. ELLEN NOLAN, February 15, 1898, Sacred Heart Church, Dalton City, Illinois; b. Dalton City, Illinois; d. 1900. 5. iv. LEWIS B. DUNN, b. July 06, 1865, Milam Township, Macon County, Illinois; d. July 24, 1903, Dalton City, Illinois. m. Lizzie Henneberry, November 29, 1893, Sacred Heart Church, Dalton City, Illinois. v. ELIZABETH DUNN, b. 1867; m. THOMAS MCGOWAN, October 19, 1892, Sacred Heart Church, Dalton City, Illinois. d. April 15, 1917.
vii. ANNA T. DUNN, b. July 10, 1874; m. JOHN HENNEBERRY, April 30, 1895, Sacred Heart Church, Dalton City, Illinois; d. Dalton City, Illinois. viii. NELLIE DUNN, b. Macon County, Illinois; m. MICHAEL MCCARTHY, October 20, 1897, Sacred Heart Church, Dalton City, Illinois. Peter Dunn age 36, Mary age 33, John age 11, Marie age 9, Will age 7, Louis age 4 and Lizzie age 2. 1880 Macon County, Illinois Census for Milam Township page 12. 110-110 taken June 12, 1880. Peter Dunn age 48, wife Mary age 43, children all born in Illinois: John age 20, Mary age 18, William age 17, Lewis B. age 14, Lizzie A. age 12, Katie M. age 9, Annie T. age 6 and Nellie M. age 3. SEE: Sacred Heart Church in Dalton City, Illinois. One of the stained glass windows in Sacred Heart Church is in memory of Peter Dunn. Most of his children were married in this church. You can follow the links to St. Isidore Cemetery in Bethany, Illinois. Note: A John Dunn age 19 was living with Patrick Henneberry in Moultrie County census for 1880. A Peter Dunn age 24 was living with the William Dedman family in the same Moultrie County 1880 census. This should be the same Peter Dunn who married Mary Nolan. William Dunn to Peter Dunn; 80 acres in section 25 of Macon Township, $1,320. Dunn-At his residence, three miles north of Dalton City, at 4 am Saturday, July 15, 1883 of be___ disease, Mr. Peter Dunn, aged 49 years. The deceased was one of the most prominent farmers in Milam township, and enjoyed in an unusual degree the respect and confidence of his neighbors and acquaintances. He was a through farmer and foremost in every work of progress and improvement in his neighborhood. He was a loving husband, indulgent father and kind neighbor. His last sickness was of about three weeks duration , and from the first his recovery was deemed doubtful. The remains were brought to this city yesterday, accompanied by over two hundred of his former friends and neighbors of Milam township. Here the funeral cortege was joined by numerous friends from Mt. Zion, Warrensburg and Decatur. The funeral sermon was preached by Rev. Father Mackin in St. Patrick's church which was filled to overflowing by the immense throng of people who had congregated to participate in the last sad rites over the body of the deceased. After the sermon, the remains were taken to the Catholic cemetery for internment, followed by people on foot and in carriages, the line being three quarters of a mile in length. The deceased was a brother of Mr. William Dunn and Mrs. Michael Dempsey of Mt. Zion and a brother in law of Mrs. Nicholas Laux of this city, and Mrs. James Cochran of Warrensburg. he was a man of considerable means, owning at the time of his death a fine farm of over two hundred acres, fully improved and well stocked. He leaves a wife and several children. John J. Dunn age 27 married Maggie T. Nolan age 23 on May 31, 1886 in Dora Township. Maggie died in 1888. John Dunn age 37 married Catherine Hughes age 29 on Jan. 11, 1898 in Dalton City. Second wife of John. One son, died without children. Mary H. Dunn age 25 married Patrick F. Nolan on Feb. 22, 1887 in Dora Township. William P. Dunn age 32 married Ellen E. Nolan age 27 on Feb. 15, 1898 in Dalton City. No children. Lewis B. Dunn age 28 married Lizzie Henneberry age 23 on Nov. 29, 1893 in Dalton City. Three children. Lizzie Dunn age 23 married Thomas McGowan age 29 on Oct. 19, 1892 in Dalton City. Lizzie: Dec. 8, 1870-April 14, 1919. Thomas: Nov. 27, 1881-Aug. 20, 1948. Six children. Katie Dunn died May 7, 1893 of typhoid malaria. No children. Anna T. Dunn age 22 married John Henneberry age 25 on April 30, 1895 in Dalton City. Seven children. Nellie Dunn age 21 married Michael McCarthy age 26 on Oct. 20, 1897 in Dalton City. John J. Dunn and Catherine Hughes. The Hughes family came from Morgan County, IL to Shelby County, IL in the 1870's. The 1870 census for Moweaqua Township in Shelby lists Owen Hughes, his wife Mary Duffy and children; Margaret, Mary Ann, Catherine, James, John and Owen. Owen and Mary were married in New Orleans and their daughter Margaret was born in New Orleans, and the other children were born in Morgan County. Mary Ann Hughes married Edward Bresnan on April 22, 1890 in Bethany, Moultrie County. John Joseph Dunn of near Dalton City, on of the best known farmers in Macon county, died at 4:10 o’clock Thursday morning at St. Mary’s hospital. He would have been sixty-seven years old in July. His death was caused by a complications of diseases. He had been in the hospital just one week. Mr. Dunn was an unusually strong and rugged man and until a week ago, he had never known what it was to be ill. On Feb 22, he over-exerted himself and was taken to the hospital that day. Mr. Dunn was born in Macon county near Warrensburg, July 14, 1861 and has lived in the county all his life. He and Miss Kate Hughes were married at the Church of the Sacred Heart in Dalton City in 1897. For the last forty-nine years he resided on the farm three miles west of Dalton City. he was a member of the Church of the Sacred Heart in Dalton City, the National Society for the Propagation of Faith and of Marquette council, Knights of Columbus in Decatur. he was known to almost all the old residents of the county and was held in high regard by all. He is survived by his wife and three sisters, Mrs. Patrick Nolan of Las Vegas, N.M., Mrs. Nellie McCarthy of Tampa, Fla. and Mrs. John Henneberry of Dalton City. The body was taken to Moran & sons funeral directors and prepared for burial. The funeral will probably be held Saturday at the Church of the Sacred Heart. Peter J. Dunn died at 5:15 o’clock Thursday afternoon in St. Mary’s Hospital after an illness of ten months. The cause of his death was a complications of diseases. He was born in Milam township and lived in and around Dalton City all his life with the exception of two years which were passed in Decatur. he leaves a widow, Carrie, and his parents Mr. and Mrs. John J. Dunn of Dalton City. he was the only child of Mr. and Mrs. Dunn. The body was taken to Moran’s chapel and prepared for burial. Funeral arrangements have not been completed. C. McCarty age 38 born in Ireland; Kate age 30 born in Ireland; Maggie age 14; Michael age 10; Annie age 9; Lizzie age 5; John age 2. All children born in Illinois. St. Isidore Cemetery: Cornelius McCarthy; June 6, 1839 - July 27, 1909. Nolan Family: See this web site. Notes on marriages: Four members of the Dunn family married into the James Nolan family. buried in St. Isidore cemetery Bethany, Illinois. parents of Lewis: Peter Dunn and Mary Dempsey Dunn. Lizzie Henneberry: born: Dec 5, 1869 in Wilmington, IL Parents: James & Elizabeth Henneberry. died: March 9, 1960 in Decatur, IL buried in St. Isidore cemetery. married Lewis Dunn on Nov 29, 1893 in the Sacred Heart Church in Dalton City, IL; Lizzie was 23 & Lewis was 28. Witnesses: Frank Corcoran & Agnes Henneberry. Marie Dunn: grand-daughter of William. Aimee Dunn: grand-daughter of Peter. Homer Dunn: born: July 2, 1865 in Findlay, IL. Died: Adjudicated deceased on March 6, 1939 in Macon County Court, Decatur, IL. buried in St. Isidore cemetery. Daughter of Lewis Dunn & Lizzie Henebery Dunn. From Decatur Herald & Review. Sept. 1921: Marriage of Vera Dunne and Bernard Witt. "The marriage of Miss Vera Dunne and Bernard Witt took place in St. Patrick’s Catholic Church Thursday morning at 7:45 o’clock. The marriage ceremony was performed by Rev. Father Murphy. They were attended by Miss Aimee Dunne, sister of the bride and Francis Witt, brother of the bridegroom. The bride wore a brown Duvet de Laine suit with gray squirrel trimmings and hat and shoes to match. The bridesmaid also wore a brown beaver trimmed suit with corresponding hat and shoes. The wedding breakfast was served in the home of the bride’s parents, Mr. and Mrs. D. F. Kinney, 354 Main Street. The couple left immediately for Chicago. During the week a number of parties were given in honor of the bride. Miss Marie Traughber entertained the Octo club in home near Mt. Zion Thursday afternoon. The affair was a miscellaneous shower. Mrs. C.F. Kekelsen gave a kitchen shower on Monday evening, entertaining about 20 guests. The evening was spent in hemming and decorating tea towels for the bride. A variety shower was given on Wednesday evening by Miss Irma Dunn in her home 525 W. Eldorado who entertained three tables of 500 with a two course luncheon. After their return from Chicago, Mr. and Mrs. Witt will be at home to their friends in 717 West Eldorado street." Mrs. Bernard (Vera Marie Dunn) Witt, 73 of 90 Ridge Lane, died at 7:55 pm Saturday in the Macon County Tuberculosis Sanatorium. Funeral services will be at 9:30 am Tuesday in St. Patrick Catholic Church. Burial will be in Calvary Cemetery. There will be no visitation. The J. J. Moran & Sons Funeral Home is in charge of arrangements. Mrs. Witt was born in Findlay, a daughter of Louis and Lizzie Henneberry Dunn. She was a member of St. Patrick Catholic Church. She was married to Bernard Witt in Decatur, Sept. 8, 1921. He preceded her in death. Surviving are daughters, Mrs. Roger (Shirley) ________ of Decatur and Mrs. James (Maurine) Brown of Peoria, a sister Mrs. Aimee Knowles of Decatur, eight grandchildren and a great-grandchild. The family suggests memorials to St. Mary’s Hospital. Mrs. Aimee (Dunne) Knowles, 75, of South Side County Club Cottage 35 died 10:45 pm Saturday in 1305 W. Main St. Funeral services will be 9:30 am Tuesday in St. Patrick’s Catholic Church. Visitation will be 6 to 8 pm Monday in J. J. Moran & sons Funeral Home, with 7 pm Wake service. Burial will be in St. Isidore Cemetery, Dalton City. Mrs. Knowles was born in Findlay, a daughter of Lou and Lizzie Dunne. She was house mother for Tau Kappa Epsilon Fraternity for five years and was a member of Holy Family Catholic Church. Surviving are a daughter, Mrs. James (Marilyn) ______ of Decatur; son, Ronald of Fullerton, Calif.; six grandchildren. One brother and one sister preceded her in death. From the Bethany Echo: Friday, July 31, 1903. Lewis B. Dunn died at his home Friday morning, July 24th of apoplexy, aged 36 years, 11 months and 24 days. He was born near Warrensburg in 1867. He was married to Lizzie Henneberry November 29, 1893, and to this union were born three children who survive him. About three years ago Mr. Dunn purchased some rice land in Louisiana and moved there. While residing there he contracted malarial fever and never fully recovered. About a year ago he returned and had been in his usual health until Thursday about midnight when he became quite sick. He grew worse and died a short time before noon Friday. A few days before his death, he traded his Louisiana land for a farm near Mt. Zion and some property in Decatur. The funeral took place Sunday afternoon at 1 o'clock from the Sacred Heart Church, Rev. Father McGuire officiating. The internment was in St. Isidore cemetery. The floral offerings were beautiful. J.H. Uppendahl, George Bobbitt, William Hogan, Michael Hogan, William Delahunty and William Kennedy were pall bearers. The Modern Woodsmen of America attended in a body. Notes on pall bearers: John Henry Uppendahl was married to Margaret Henneberry, the daughter of William Henneberry who was Lizzie's uncle. Lizzie's brother, David Henneberry, was married to Mary Delahunty. William Delahunty was the brother of Mary. William and Michael Hogan were brothers. Michael Hogan married Margaret Delahunty, the sister of Mary. William Hogan was married to Kathyrn Fitzgerald, the daughter of Ellen Delahunty who was a sibling of William, Mary and Margaret Delahunty. Michael and William Hogan's brother, Edmund T. Hogan married Theresa Dunn who was the first cousin of Lewis Dunn. Also buried in St. Isidore Cemetery. Michael Hogan; March 29, 1864 - Feb. 20, 1935. Margaret Delahunty Hogan; Aug. 12, 1856-Mar. 18, 1941. William Hogan; 1872-1945. Kathyrn Fitzgerald Hogan; 1876-1962. William Delahunty; Aug. 15, 1868. Ella Griffin Delahunty; July 20, 1871 - June 4, 1966. Lizzie Henneberry Dunn. Wife of Lewis Dunn. Decatur Herald & Review. Saturday, December 5, 1953. "Two Observe Birthdays Today. Mrs. Lizzie Kinney, 354 W. Main St., is observing her 84th birthday today. It will be a double celebration because her granddaughter, Mrs. Roger ________, 728 W. Wood St., is marking her 23rd birthday today. The two will be guests of honor at a family dinner being given by one of Mrs. Kinney's daughters, Mrs. Bernard Witt, 442 W. Prairie Ave. 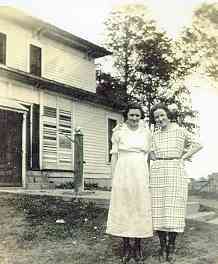 The other daughter, Mrs. H. M. Knowles makes her home with Mrs. Kinney. The 84 year old woman has lived in Decatur since 1951. She has four grandchildren and three great-grandchildren." (Note. She moved to Decatur in 1915 not 1951). Decatur Herald & Review. March 10, 1960. "Mrs. Elizabeth "Lizzie" Kinney, 89, of No. 35 South Side Country Club, died 11:40 am yesterday at 640 W. Main St. Mrs. Kinney was born Dec. 5, 1870 in Wilmington, a daughter of James and Elizabeth Magner Henneberry. She married Lewis Dunn, who preceded her in death. She then married Daniel Kinney, who died in 1931. Mrs. Kinney was a member of St. Patrick's Catholic Church. She leaves two daughters, Mrs. H. M. Knowles and Mrs. Bernard Witt, both of Decatur; and a brother, Ambrose Henneberry of Chicago. Requiem high Mass will be sung at 9 am Saturday in St. Patrick's Catholic Church. Burial will be in St. Isidore's Cemetery, near Bethany. Friends may call after 6 pm today at the J. J. Moran & Sons Funeral Home." (Note: She was born Dec. 5, 1869). Miss Katie Dunn died of typhoid malaria Sunday at the home of her mother in Milam Township, aged 22 years. The deceased was a sister of Mrs. Thomas McGowan of Decatur. The funeral will be held in Decatur at St. Patrick's church at 11 o'clock today. Father Clancey of Dalton City will officiate. From Bethany Echo, Friday April 9, 1915. Dalton City: W. P. Dunn died at the St. Mary's hospital at Decatur Monday evening at five o'clock. Death was caused by a complication of diseases that developed from asthma with which he had suffered for the past ten years. He had been seriously ill at the hospital for seven weeks. Mr. Dunn was active in the management of a large farm near this place where he made his home. He was fifty years of age and was born and reared in Macon County. Twelve years ago he was married to Ella Nolan. His wife died two years later. He leaves the following brothers and sisters: J. J. Dunn of Dalton City, Mrs. P. F. Nolan of East Las Vegas, New Mexico, Mrs. Thomas McGowan of Decatur, Mrs. John Henneberry of Dalton City, and Mrs. Nellie McCarthy of Haskell, Oklahoma. Mr. Dunn was a member of the Sacred Heart Church of this place and the Knights of Columbus and the M.W.A. the body was taken to the Moran undertaking parlor and prepared for burial and from there was taken to the home of his sister, Mrs. Thomas McGowan of Decatur and was then brought to Dalton City Wednesday at 11 o'clock and funeral services held at the Sacred Heart Church. The burial was in St. Isidores, Bethany, Illinois." W. P. Dunn dies in St. Mary's Hospital. Wealthy Land Owner of Dalton City Suffered Asthma for the Last 10 Years. W. P. Dunn of Dalton City died in St. Mary's hospital at 6 o'clock Monday after a long illness. His death was caused by a complication of diseases that developed from asthma which he had suffered for the last 10 years. He had been seriously ill and confined to the hospital for the last seven weeks. Mr. Dunn was one of the wealthiest land owners of Macon county and was active in the management of a large farm adjoining the city where he made his home. He was 50 years old March 2 and was born and reared in Macon county. He married 12 years ago and his wife died two years later. He leaves the following brothers and sisters: J. J. Dunn of Dalton City, Mrs. P. F. Nolan of Las Vegas, New Mexico, Mrs. Thomas McGowan, 525 North Franklin street, Decatur, Mrs. John Henneberry of Dalton City and Mrs. Nellie McCarthy of Haskell, Okla. Mrs. Nolan was with him during his last illness. Mr. Dunn was a member of Sacred Heart Catholic church of Dalton City, the Knights of Columbus and M. W. A. The body was taken to the Moran undertaking establishment and prepared for burial and will be removed to the home of Mrs. Thomas McGowan this morning. It will be taken to Dalton City at 10:30 Wednesday morning and funeral services will be conducted the the Sacred Heart church. Burial will be in St. Isidore's cemetery north of Dalton City. Decatur Council No. 577, Knights of Columbus will meet at 7:30 this evening and make arrangements to attend the funeral services." Decatur Daily Herald: April 8, 1915. "Large Funeral Party Goes to Dalton City. Funeral services conducted in Sacred Heart Catholic Church there for William P. Dunn. Funeral services for William P. Dunn were conducted at 11:30 Wednesday morning in the Sacred Heart Catholic church of Dalton City. The funeral party left Decatur in a special attached to the Illinois Central train that leaves Decatur at 10:40. The Knights of Columbus accompanied the body to the train and many of them attended the services in Dalton City. It was one of the largest funerals ever held in that city. The services were conducted by Rev. Father Curran. The music was furnished by the regular church choir with Miss Anna Doran of Decatur as soloist. The bearers were Frank J. Mooney, J. R. Fitzgerald, Thomas Ryan, George Goodman, Louis R. Ryan and Thomas Townsend. Burial was in St. Isadore's cemetery." 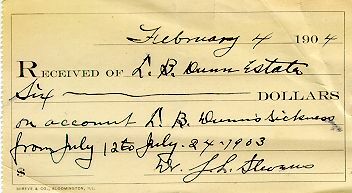 NOTE: William P. Dunn was the brother of Lewis Dunn and the sister of Anna T. Dunn. "Mrs. William Dunn died at nine o'clock Tuesday evening at her home one mile west of town from that dreadful disease, consumption. She had been sick for some time. Last winter she and her husband spent three months in New Mexico for the benefit of her health but it was of no avail. She is the daughter of Mr. and Mrs. James Nolan and was born south of town March 17, 1866. She received her education in her home school and several years was a successful teacher in this county. She was married to Will Dunn in 1897 and during her many months of sickness he has done all a husband could to relieve her of the disease. The funeral was held at the Sacred Heart church yesterday at 10 o'clock, the services being conducted by Rev. Fa. McGuire. The body was laid to rest in the cemetery at St. Isadore. She leaves a husband, father, four brothers and three sisters besides a host of other relatives and friends to mourn her untimely death." "Long Train of Mourners followed remains of Mrs. Dunn to their resting place. The burial of Ellen, wife of William Dunn occurred at St. Isidore cemetery four miles east of Dalton City on Thursday. The funeral services were held at the Sacred Heart church in Dalton City at 10 o'clock in the forenoon. In all of the history of that country, there was never such an outpouring of the people generally especially to a funeral as was witnessed at the funeral of Mrs. Dunn. The deceased was 35 years old and had been married only two years. Her maiden name was Ellen Nolan and for a number of years, she had taught school in that part of Moultrie county. With all her former pupils and their parents, she was popular in fact she was loved and only expressions of regret at her untimely death and tender words of praise for her kindly ways can be heard. It seems as though for each individual she had done some act of kindness that had endeared her to them all. The church was all too small to accommodate all who came to hear the funeral service. Rev. Father McGuire conducted high mass and afterwards delivered a sermon referring especially to the many lovable traits of her character which all so well remembered. The music was furnished by the full choir of the church. The family residence was a mile west of the church and when the hearse and first carriages had reached that edifice, many of the wagons and buggies had not yet started from the residence. There were many handsome floral offerings from the friends of the deceased. The pall bearers were, William Hogan, John Henebry, William Delahunty, John Foley, Patrick Fogarty and Albert Corcoran." "Peter J. Dunn, formerly of Dalton City, died at 5:15 Thursday afternoon at St. Mary's hospital. He had been suffering from a complication of diseases for the past ten months. He was born in Milan township and nearly all his life was spend in and about Dalton City. He was the only son of Mr. and Mrs. John J. Dunn of Dalton City. He moved to Decatur about two years ago. He is survived by his parents and his wife, Mrs. Carrie Dunn. The body was removed to the Moran undertaking establishment and prepared for burial." Funeral was at Sacred Heart Church on Sunday forenoon. Anna Theresa Dunn, daughter of Peter & Mary Dempsey Dunn was born July 10, 1874 in Warrensburg, Macon County, Illinois. She died April 29, 1955 in Dalton City, Moultrie County, Illinois. She married John Henneberry April 30, 1895 in Macon County. John was the son of Patrick Henneberry. Patrick was the brother of James Henneberry. Lizzie, the daughter of James Henneberry, married Lewis Dunn who was the brother of Anna. Harry Edward: June 22, 1898 died April 13, 1971 in Illinois. Married Zita Marie McKey May 5, 1927 in Chicago. William Wayne: July 27, 1901 died Oct. 18, 1973 in Illinois. Married Clara Young Dec. 27, 1928 in Illinois. Mary Helen: September 14, 1903 buried in St. Isidore. Married Wilbur Smith April 11, 1923. Nellie Elizabeth: May 27, 1906. Married Ray Ibison about 1930. Anna Ruth: March 20, 1911 Moultrie County, died Oct. 17, 1918 influenza epidemic. John: Oct. 11, 1916 in Moultrie County, died July 16, 1964 in Illinois. Married Mary McClory on July 23, 1959. "Mrs. Anna Henneberry, 80, of Dalton City, died at 2 am yesterday at her home. She had been ill for the past four months. She was born July 10, 1874, in Warrensburg, the daughter of Peter and Mary Dempsey Dunn. She was married to John Henneberry April 30, 1895. He preceded her in death in February, 1949. Mrs. Henneberrry was a resident of Dalton City for the past 78 years. She was a member of the Sacred Heart Church there. She is survived by three sons, Harry, Hammond, IL; Wayne, Lake City, John, Dalton City; three daughters, Mrs. Louise Brown, Macon, Mrs. Helen Smith, Dalton City, and Mrs. Bess Ibison, Chicago; a sister, Mrs. Nellie McCarthy, Vernon, Tex; 18 grandchildren and seven great-grandchildren. A solemn high mass will be said at 9:30 am (CDT) Monday in the Sacred Heart Church, Dalton City, with burial at St. Isidores Cemetery near Dalton City. The body is at J. J. Moran & Sons Funeral Home. Friends may call there after 3 pm today. Rosary will be recited by members of the Sacred heart Catholic Church of Dalton City at 8 pm Sunday in the funeral home." John Henneberry, 78, Dies in Dalton City. "John Henneberry, 78, retired farmer who lived in the Dalton City area most of his life, died at 7 pm yesterday in his home. He had been in failing health two years and was seriously ill two weeks. Mr. Henneberry was born Oct. 14, 1870 in Wilmington, a son of Patrick and Julia Henneberry and married Anna Dunn in Dalton City April 30, 1895. He was a member of Sacred Heart Catholic church in Dalton City. Besides his wife, he leaves three sons, Harry of Hammond, Wayne of Lake City and John Jr. at home, three daughters, Mrs. Louise Brown of Macon, Mrs. Helen Smith of Dalton City and Miss Bess Ibison of Chicago, two brothers, James of Olivia, Minn, and David of Los Angeles, and 17 grandchildren. The body is in Moran & Sons funeral home. Arrangements are incomplete." Harry Edward Henneberry, 72, Dalton City died 2:30 pm Tuesday, Decatur Memorial Hospital, born Dalton City, retired farmer, member Sacred Heart Catholic Church, Dalton City, knights of Columbus, married Zita McKey, she died in 1946. Leaves sons, Lee, Toulan; James and Donald both in Dalton City, brother Wayne H., Clarence, Mo. ; sisters, Mrs. Ellen Smith, Dalton City, Mrs. Bess Ibison, Chicago, five grand children. One brother, two sisters preceded him in death. services 10 am Thursday, Sacred heart Catholic Church, Dalton City. Burial Calvary Cemetery, call from 4 to 9 pm Wednesday at J. J. Moran & Sons Funeral Home, Decatur. Prayer service 7:30 pm Thursday at the funeral home. Mrs. Zita McKee Henneberry, formerly of Decatur and more recently of Hammond, Ill. died at 12:45 am Sunday in the Carle Hospital clinic in Urbana where she had been a patient for five weeks. She had undergone a major operation at that hospital in September and suffered a relapse five weeks ago which made it necessary for her to return to the clinic. The daughter of the late Edward and Mrs. Alice McCluskey McKee, she was born in Decatur on Aug. 25, 1902. Here she attended St. Patrick's parochial school and St. Teresa' academy. She was married in 1928 to Harry E. Henneberry in Chicago. After their marriage, the couple lived on a farm near LaPlace, moving 18 years ago to a farm near Hammond where they have lived since. She was a member of St. Michaels Catholic church in Bement and of the church's Altar society. Her father preceded her in death in 1944 but her mother survives her. Also surviving are her husband the three young sons, Lee, Jimmy and Don, all at home. A sister, Mrs. Harry Falk is a resident of Denver, Colo, but was with her sister at the time of her death. One brother Thomas H. McKee is a resident of Decatur. The body was removed to the Moran & Sons funeral home where friends may call after noon today and through this evening. The body will be moved to the residence near Hammond tomorrow where friends may call after 1 pm. Requiem high mass will be recited at 9 am Wednesday in Hammond and the body will be brought to the Calvary cemetery in Decatur for burial. Magowan, McAgown, McEgown, McIroine , and Gowans . Katherine: 1893-1947. married Anthony Irwin Vollmer 1893-1966. Anthony was the son of Phillip (Jake) Vollmer and Ellen Foley. Ellen was the daughter of John Henry Foley and Margaret Henneberry Foley. Thomas McGowan: husband of Elizabeth Dunn, son in law of Peter and Mary Dempsey Dunn. Thomas McGowan, 86, one of the owners and operators of the Kraft Hotel, 555 North Front street, died at 11:15 am today in St. Mary's hospital where he had been a patient for the last three months. Mr. McGowan who was associated with the late Edward F. Dunn and the late George Kraft in building and operating the hotel had been active in the business from its construction in 1907 until about six months ago. Mr. McGowan was born in St. Louis, Mo., Nov., 27, 1861, the son of Fenton and Catherine McGowan. He had made his home in Decatur since graduating from the Christian Brothers college in St. Louis when he was a young man. He was married to Elizabeth Dunn of Decatur, Oct. 19, 1892. She preceded him in death, April 15, 1917. He leaves three sons, Dr. E. McGowan and Attorney Virgil McGowan of Decatur and Dr. E. C. McGowan, Chicago; three daughters, Mrs. Nellie Talbott and Mrs. Elizabeth White of Decatur and Mrs. Mary Reis, Chicago and nine grandchildren. The body was taken to Moran & Sons funeral home. Funeral arrangements are incomplete. Mrs. Francis Elizabeth Jane "Tootie" McGowan White of 47 Montgomery Place died 3:50 am in St. Mary's Hospital. Mass of the Resurrection will be 11 am Tuesday at St. Patrick Catholic Church. No visitation. Burial will be in Calvary Cemetery. J. J. Moran & Sons Funeral home is in charge. Memorials, donor's choice. Daughter of Thomas and Elizabeth Dunn McGowan. She was a member of Country Club of Decatur, served on the board of local chapter of American Cancer Society, Webster Hall and Illinois Women's Golf Association. She was a former teacher at Centennial Junior High School. She married Francis A. "Smock" White. Surviving are her husband, brother, Virgil McGowan of Decatur. Three brothers and three sisters preceded her in death. Maggie T. Dunn: wife of John J. died May 8, 1888 age 25 years, 10 months, 4 days. Ellen E. Nolan Dunn: wife of William P. Dunn, born March 17, 1864, died August 27, 1901.